Krishna Nayak is a Professor of Electrical Engineering with joint appointments in Radiology and Biomedical Engineering. 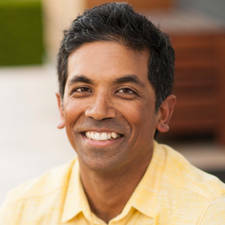 Prof. Nayak received a PhD in Electrical Engineering from Stanford University in 2001, an MS in Electrical Engineering from Stanford in 1996, and BS degrees in Electrical Engineering, Computer Science, and Applied Mathematics from Florida State University in 1995. My lab's research mission is to develop and clinically translate novel magnetic resonance imaging (MRI) technology. Our contributions to date have included new MRI pulse sequence designs, data sampling and image reconstruction techniques, and artifact mitigation techniques. We have a diverse portfolio of projects that currently includes new tools for cardiac stress testing, obstructive sleep apnea assessment, brain tumor evaluation, and the study of normal and abnormal speech production. The common theme is the development of rapid and quantitative MRI techniques, and to work closely with experts from other disciplines to translate and validate this technology. We have a long track record of collaboration with cardiologists, radiologists, pulmonologists, obesity researchers, otolaryngologists, endocrinologists, linguists, and MRI technicians.